In the last episode, Razor experienced the divine encounter her brother Ebony ran from. This led to revelations of what transpired in her childhood that transformed her into the powerful and mysterious young woman she became. She just couldn’t stop the tears of joy resulting from getting a second chance from God when she thought her fate was sealed. Will Ebony toe the same line or will the lure of the sins of the flesh and unbridled pursuit of money prevent him from doing so? Then there is the case of Tasia, his beautiful neighbour, who returned ahead of schedule towards the end of the last episode? How will she fit into the current developments? Find the answers in this sixth and final episode of our captivating story. If you’re just joining us, be sure to read the previous episodes before this to get the full load of entertainment and blessings. My mouth was agape. Chidinma was Razor’s given name but we all called her Dinma way back. (That name was our mum’s idea but our dad called her Ifeatu*.) After she changed and became a toughie, everyone started calling her Razor. I’d never mentioned her to Tasia. I only told her about my elder sister, Nonye. So how did she know her, down to her real name from childhood? Razor opened the curtain and peeped out. The next thing that happened baffled me even further. Tasia left me and ran to my flat. She gathered Razor into her arms and began to crush her like a long-lost friend. Razor, on her part, clung to her. Unbelievable! Razor doesn’t do mush, I reminded myself. What is going on? Tasia, disengaged herself from Razor and held her some inches away. Looking into her eyes, she said, “You have done very well. Congratulations and welcome to the family of God!” She enfolded Razor in another extended hug. My goodness! I was overflowing with questions but I had no chance to ask them. Tasia took Razor by the hand and they sat on the sofa. She explained that she needed to be properly prayed for to cut her ties with the kingdom of darkness. She would also need to be in close company with believers who would nurture her in the faith and help her battle through the inevitable attacks that would follow her renunciation of the devil. She had arranged for Razor to stay with her pastor and his family and would like to take her there right away. I was referring to the new Razor before me. If it was the old one, I would have been more worried about the welfare of those she was to live with, not that she would have ever agreed to stay under anyone’s roof. Tasia wanted to say something but I held up my hand indicating she should let me finish. “I mean you are not equipped to handle what’s coming.” She ran to hold Razor down as she had started convulsing. “You mean you,” she replied, indicating I was the one who was petrified. She was right but I wasn’t going to admit that. Just then, Razor let out a bloodcurdling scream and I nearly jumped out of my skin. Her eyes began to roll till they were all white and she did a series of high-pitched shrieks that sent me sprinting for the door. I started the car, warmed the engine for a few minutes, then revved it and tooted the horn several times. When they didn’t emerge, I turned off the engine and came back to see what was holding them up, only to see Razor slumped and Tasia commanding the spirit of death to let go of her. Death? I ran to her and felt for her pulse. None. I was babbling. Meanwhile, Tasia was pacing the room like a military general, quoting the Bible and speaking in some strange language. Then she commanded me to be quiet. Commanded was the word. I’d never seen the woman speak with such authority. “She will be fine.” How do you know that? I couldn’t voice the question because she had knelt beside Razor as she spoke, placed her right hand on her chest and began to sing and laugh in this foreign language that filled me with dread. I had goose pimples all over my skin as she carried on. This woman is deadly, I told myself. I’d hate to be on the receiving end of this her chant. I realised I never even knew her. I just saw the beautiful wrapping, I had no idea she had so much spiritual power. I didn’t really want to be there but I was paralyzed with fear. Besides, I was anxious about Razor. Then I noticed Tasia was calling Razor’s name. The surprising thing was she didn’t call her Dinma but Ifeatu. I figured that was the name she was known by in the spirit realm, probably because she was initiated with it. No one told me but I knew she was summoning her spirit out from the realm of death. I closed my eyes and sensed thick darkness. I began to whisper, “Blood of Jesus! Blood of Jesus!” There was no power in my pronouncements. What right did I have to seek coverage from the blood of Jesus? Then I remembered a story I heard about demons entering any available person when they are chased out. The way Tasia was sounding, that could be any moment. I didn’t want to die, not just yet. So I ran into my bedroom and wonder of wonders, the Lord Jesus, was waiting there for me. I didn’t actually see Him or hear an audible voice. It was just like before, words in my mind and a Presence in the room, only that this time, I knew those weren’t my thoughts and I wasn’t going to run away. I don’t know how but I clearly understood what He meant. Tasia was His representative or better still, He was in Tasia dealing with the matter. That also meant the outcome of that situation was in the bag. I then saw why Tasia could declare calmly about Razor, “She will be fine.” I exhaled. He gently explained that He sent Tasia to be on hand when Razor surrendered to Him and to hand her over to saints that would care for her. He revealed that Razor was destined to be a fiery evangelist but that the enemy came in early to pervert her call and steal her soul. I closed my eyes and said, “Yes, Lord, I do!” Such joy filled my heart that I broke out in worship. This is what I do for a living, entertaining crowds with gospel songs, but this time I wasn’t singing for tips or applause. I was lost in pure and unadulterated adoration to the Lord. I forgot about time, the commotion in my living room and everything else, until Tasia came and touched my uplifted arm. “He’s gone!” I lamented when I opened my eyes. “Praise God!” I shouted, running towards the living room. Tasia followed me with a blanket. She covered Razor, who was curled up on the floor, with it. “Thank you so much.” We stood there in silence, watching Razor sleep. My heart told me I will now be responsible for her upkeep. Then I remembered there had been no time to ask the Lord for a solid means of livelihood but I had got the greatest gift of all: reconciliation with Him. I was excited that I would be embarking on a journey of faith with Him and there would be plenty of time to ask Him that and many more questions along the way. There may be some rough times ahead but Razor and I would be fine regardless. I was certain of that. The journey would see me making some major adjustments to my lifestyle, like in my relationship with women and how I think about them, especially Tasia. It won’t be easy going by how steeped in that stuff I am, but with the kind of interest the Lord Jesus showed in me and my sister today, I’m confident He’ll help me reorder the trajectory of my thoughts about them and act accordingly. And in Tasia’s case, I can start by calling her a more respectful name, the name she used to introduce herself to me, Mama Chinonso. It may not seem like a big change but it will be a constant reminder that she is not to be messed with, not that I would dare to do so after the kind of display she gave today. Listening to Razor snoring softly almost made my heart burst with joy. It was such a precious sound to hear and it was possible because of the mercies of the Lord Jesus and the angel standing beside me. She went to stretch out on the sofa and I decided it was time to ask some of the questions that arose in my mind when she arrived suddenly and all alone. I sat on an armchair adjacent to the sofa. As I listened to Mama Chinonso, I knew that she was an epitome of true beauty: not just a pretty face and a shapely body but a woman with an intimate relationship with the Lord and a deep love for others. She had shown me nothing but kindness from the first time I moved here and had brought out the best in me. I knew that if she had let me have my way with her or even encouraged my immoral moves in any way, I would have lost my respect for her. They say, “Beauty is only skin deep,” but I guess they’ve never met Mama Chinonso, my beautiful neighbour. *Chineke moo! is Igbo for “Oh my God!” It’s lamentation in this context. PS: It has truly been a pleasure regaling you with this inspiring narrative. May God guide your steps and bind you to Himself with cords of love in Jesus’ name. What do you make of Ebony and Razor’s confessions of faith? Do you feel that Ebony, especially, can last as a believer? Have you ever faced a life-threatening situation in which God displayed His awesome power on your behalf? 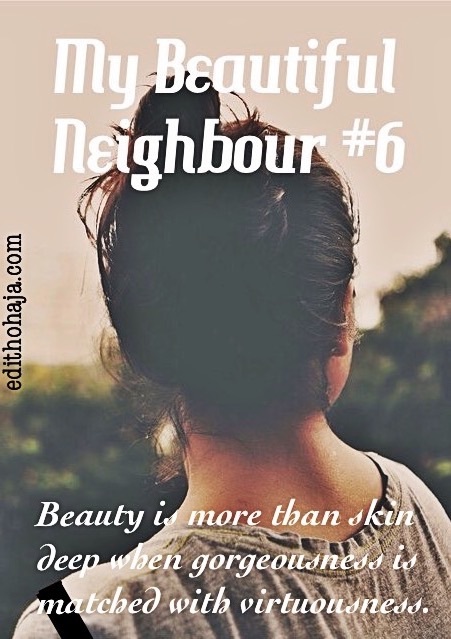 Now for a roundup: Kindly share what you’re taking away from this entire story, “My Beautiful Neighbour”. The entire story turned out glorious. The life of Ebony did not only turn out well but also that of his sister, Chidimma. God can use anyone to change ur life and when walking with God, one has nothing to worry about or lose. God is always there for us no matter how we stray or how bad we think we maybe, He is still willing and happy to receive us if we turn to Him. Thank you, Ma, for this interesting and educational post. It really reshaped my mind and ministered to me in a special way. I loved the way you utilized the suspense and flashback that held your reader's attention to the end. You also inspired me to finish my book, not only to entertain but also to encourage and inspire others in a special way. Thank you very much, Ma. I appreciate. Very well put, Chiamaka! God's grace is available for all who turn to Him as you rightly said. I pray you have abundance of wisdom to complete your book and make it a huge blessing to the readers. Cheers! You are blessed in Jesus' name. God bless you for reading and for this lovely comment. our grace differs, God can use anyone to change our life. GOD is happy any time we acknowledge our sins and are sorry for them. He will always receive us back. Yes, His word says those who come to Him, He will never cast out. Glory to His name! I don't want it to end!!! I truly believe that Ebony and Dinma will last, those kind of supernatural encounters cannot be forgotten in a hurry. With the right discipleship, they will shake the kingdom of darkness. It is kind of an eye-opener to how we somehow let traditions and mindsets keep us down. I for one would never get so close to a male neighbor, I think there should be a balance here though. Wisdom is profitable to direct. Maybe when we see them through the eyes of Jesus, it will make it better. I remember how my friends and I got close to some of our neighbors in the lodge in UNN. My friend was more open and I reserved, they responded to her better and sowed seeds that we are still trusting God will yield fruits. Those boys were baaaadddd but funny enough, they never saw us as they saw others, they respected us. I think we must also live in such a way that our lifestyles reflect Jesus. I cringe at what could have happened if Tasia got distracted by the fine bobo. Thank you ma'am for these thoughts to ponder on. God bless you. Please do another series soon. Thank you so much for your insightful comment. Seeing others as Christ sees them is so important. There is no extent we won't go to bless them if we do. And we should rep the Lord 24/7, otherwise we will be useless when situations that the Lord will want to use us arise in people's lives. We may not raise the dead, like the lady in the story, but we can be an extended hand of God or His mouth to speak words of encouragement to those we meet. And talking of raising the dead, I think that whole stuff was inspired. I was amazed when I learnt that Anastasia in Greek means resurrection AFTER writing the story. All praise and glory to God! I've been working on another series but it keeps getting longer while I'd prefer to tie it up. So it's either I give it time and add a few more episodes to what's down already or I find a neat way to conclude it. Thank you so much for following this series. I'll be looking forward to reading your own stories as you share them. Hope that coincides with when I can spare the time to scroll on Facebook. God's grace at work and with everything else. Cheers! ??? When you encounter the good works of God, you will have no option other than to leave your old life and live for him who plotted your course from time. That has been the experience of Ebony and Razor in this story and countless others in real life. Life outside of Jesus is really not worth living. True. Honour and praise to His holy name forever . wow! the story is very intresting. it finally turned out glorious for Ebony and his sister. GOD can use someone else to change your life to better because nothing is impossible for GOD to do. Yes, and the surprising thing is that it might be the person you least expect. Praise God! A wonderful piece, Aunty Edith. The story turned out wonderfully and Ebony found his way. this a story, which demonstrate the situations some people found themsevies, as the case of razor and tassia . razor was in a state of confusion in her spiritual life. he needed a good friend who would advice her to make amend in her spiritual life unfortunately tassia was of help. good friends always lead to good direction in life. Perhaps, you should read the story again or check the earlier episodes. Tasia didn't know Razor from Adam. Cheers! Ma! this story is not just an ordinary story with moral lesson. its a story to let sinner know that our Lord Jesus can arrest anyone at anytime ​with the help ​from those they don't even believe will help them . thank God for Mama chinonso. she is a God sent. I feel the same about what Ebony said "Beauty is only skin deep". The fact that a girl is beautiful on the outside doesn't mean she's beautiful on the inside, inner quality matters in a woman because when beauty is gone, only a person's character remains. The power of prayer is really a wonder as in the case of Razor. The power of prayer was so strong and effective that not only did it change her but it also brought her from the brink of death. So, we all need not to look down on the power of prayer! God can change someone's life within a twinkle of an eye. Wow...This story is amazing! It just shows Jesus is looking out for sinners and making sure they receive salvation. One of the beautiful things I witnessed in this story was how u painted images. I could just sit right here and have the picture in my mind.This, ma, is mind blowing. Praise God you enjoyed the story very well. He made it happen, every little bit of it. am touched. I didn't see that coming but all the same, its a nice one. ebony will make a perfect and strong believer for so was Paul who was once Saul in the bible. I pray God gives me Mama Chinonso's kind of beauty. Amen in Jesus' name. I'm confident He will because the Bible says, "Blessed are they who hunger and thirst after righteousness, for they shall be filled." Now to answer your questions at the end. Razor and Ebony's confessions of faith came just at the right moment. You see, this God of ours is marvellous in his timing. He never does anything too late nor too early. He rescues us before we get the chance to completely ruin ourselves. 'He sent his word and healed them and delivered them from their destructions'(Psalm 107:20) And yes, they will last as believers. After all, their journey of deliverance and joy in Christ has only just begun. To answer the second one, I believe God displays his awesome power on my behalf everyday! Not necessarily in life-threatening situations but in the little things he does for me...giving me my daily bread, preserving my life and there was this one time he healed my brother of a mental illness that brought tears to our eyes and shame to our door. We called on him and in his infinite mercy, he answered. Today my brother is doing well in his choice course in Unilag. Let anyone say there is no God and i'll tell them the story. Finally, what am i taking away from the story? Lol. Do i really have to describe this series in all its brilliance and perfection? It's a masterpiece really. One that exemplifies God's graciousness and willingness to give us sinners a second chance. Is it ever too late to say i'm sorry? To go back and start anew? It never is. Well done, Aunty Edith. You never fail to deliver. May God's redeeming grace always come through for us both now and always. Wow! Amen in Jesus' name. Your comments are unparalleled, my dear Kat! May God distinguish you always in Jesus' name. This short story shows that God normally uses someone to change people's way of life. wow!! a beautiful story. i love the way it ended. it means that God can use the least person we expect to help us when we are in trouble. and also i saw that no matter how bad we have lived our lives, when we turn to God he will not forsake us just as was seen in the life of ebony. God can strengthen us to live a righteous life and leave a wayward past behind. He looks for the best in all of us and keeps his love strong because we are his children. The story line is quite impressive- young man falls for married woman- I do feel that it'd be pretty interesting if the young woman in question falls for the handsome man's advances. I'd love to see how you'd weave such a tale. Na so! No be me go tel u dat kind tory. with God all things are possible. who would have believed that chidimma will come back to life again? the story is full of suspense and anxiety to know what happens next. Ma, this story is wonderful. i cant even control the tears of joy that are rolling down from my eyes. how can i describe this almighty God who is always ready to help us in all situations, who is always with us, who is ever ready to forgive us our sins? God wanted to change the life of Ebony and his sister, Dimma, and he used Mama Chinonso to achieve that. i pray that God can also use this story to change many souls. Aunty, God bless you. Wow! Thank you for appreciating the story and expressing your perceptions so clearly. A big "Amen" to your prayer and I say God bless you too, my dear. Wow,this is so lovely i never expected it to turn out this way but i really love it.Mama Chinonso(Tasia) as Ebony calls her turned out to be the means God used to save Ebony and Chidimma from the hand of the devil.This is really lovely ma more grace to you. This story is interesting, ma. It really gives hope to those that feel that God cannot listen to them because of their sinful life.......Even the bible said that the most righteous man sins at least seven times a day. So brethren, don't feel too inferior because God knows our weaknesses. Ummmm, Collins, that God knows our weaknesses does not mean we can condone sin or live in it deliberately expecting God to overlook it and run to our aid whenever we need help. Rather, it means that God understands the weakness of our flesh and will forgive us when we err and confess in repentance. Also, when the Bible talks about a righteous man falling, it is referring to trials of life, not sin, and it didn't say it will all happen in one day. It could be over the course of one's life. It is a testimony to the resilience of the person of faith. Take a look at that verse and the surrounding verses in the KJV and you will agree with me. Proverbs 24:16 "For a just man falleth seven times, and riseth up again: but the wicked shall fall into mischief." You are blessed! The story is very insightful..... No matter how far we think we have gone, God is always there to draw us closer to him. AWESOME!!!!!!!! This story should really overstep the boundaries of this blog, Ma. People out there need to see this!! Nice read, Ma. Gladness overfloods my heart upon the realisation that Ebony's soul was snactched from the custody of the devil. Really glad you enjoyed the story. Will see how it can be issued on a bigger basis by God's grace. Thank you and be awesomely blessed of the Lord in Jesus' name. There's really no other friend as the sweet lowly Jesus! When we think we've gotten to the point of no return, The Awesome Heavenly Father gives us a second chance.There could be no other one as benevolent, as sweet, as pure, as LOVING like The heavenly father! God bless you, ma, you are a blessing to many. One doesn't need to sponsor extrvagant give aways in order to reach lives. Actually ma, you are doing a really excellent job here. Thanks a lot for the encouragement. 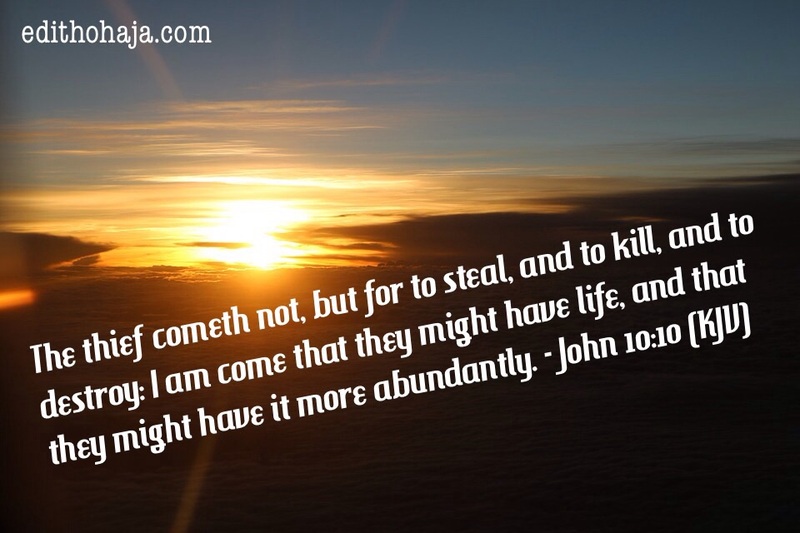 You are super blessed, John, in Jesus' name. Ifeatu's resurrection proves that God is all powerful. Therefore, giving our life to Christ means he takes over. Indeed the story is very interesting and touching, it shows that salvation and renewal can occur to God`s people at any instant in time and that God has a way of winning his children to himself, as He is the one with the keys to the hearts of the kings no matter how hardened their hearts may be. it also shows how the power of God can intervene or overcome spiritual powers and He(God) can use anybody as an instrument to achieve this, irrespective of whom we think the person is, as regards Tasia, and at the end Ebony and his evil sister were delivered from the evil one. May God reward you ma!, for the wonderful and inspiring post. The story is amazing. The neighbour is indeed beautiful because the Most Beautiful God is in her and used her to make the hitherto ugly Razor a beautiful person. Such a beautiful ending! I didn't expect the twist and the turns but there they are. I'm happy for Ebony and Razor. While reading, I felt like I was there in the story. Nothing and no one is above God. He can bring anyone to Himself, that's why He's God. Thanks Aunty for this story. I pray to live my life like Tasia who though beautiful and all was still on fire for God. Christians have so forgotten who they are that people can't tell the difference between them and the world. There ought to a difference. And I hope to be a true reflection of Christ. This story is touching. Who said there is no power in the name of Jesus? God is all powerful, all merciful and He is the only one that can set the captives free... I must confess that this story has really touched my life... God bless u and ur household, ma, for this wonderful story. u are indeed a God-sent to the youths and my prayer is that God will equally use this story to touch the lives of my fellow youths that are going astray IJN. More power to ur elbow, Ma. Remain blessed. The wonders of the lord was active in the life of ebony's sister, this post though fictional is very serious and touches on some aspects of real life experiences. The story is amazing. Nobody could possibly believe that the twists and turns will be to that extent, that even Razor could turn out beautiful. It is really fascinating! wow, what an inspiring and motivating story. the story was well articulated, i was really moved. This story portrayed the infinite mercies of God upon us all, no matter the gravity of sins we have committed, God can still forgive us. Hmmmmm. That's the reason why no one knows tomorrow. One can keep on doing what one likes but when God says it's time, then it's time. Razor had no control over what was happening to her. There is something l love about ur stories. Some touch part of life, especially this one remind me of myself. I wish i could make a total u turn in reality like the male character in the story. Mum, i must confess, this has touched me deeply. Thanks ma. Praise God! You can change too, you know. All you need is to decide and surrender to Jesus. He will help you take it from there. You are blessed! What an interesting story, no matter how we think that our sins are God can still take us back so far we surrender ourselves to him. oh! how i wish that the whole students will read this short story to internalise and understand GOD's love for us. At least, very many souls must surely be saved because it is educational and inspirational. When things do not work out well, we need still need to fall back to Christ. Yes, my dear, things aren't always what they seem. We should never underestimate or write off anyone because we don't know God's plans for them or what they are capable of in a moment of crisis. Thanks for following the entire series and be richly blessed of the Lord in Jesus' name. This shows how merciful our God can be, he doesn't want his children to wallow and die in sin, because the devil only came to steal, kill and destroy just as he wanted to destroy ebony but God intervened and saved his soul. When things do not work out the way we want, we still need to hold our faith to GOD knowing that when you are with him you need not worry because you're safe. He will never allow the eyes of the devourers to see you. He is indeed merciful. I wonder which character you are referring to here. None really seems to fit as I compare your comment to the story, except maybe Razor and the last part of your contribution. Our God is so merciful that even after our sins, he doesn't want us his children to die in sin. His love for us is awesome. Divine encounter changes the person's life, as it has been the experience of Ebony and Razor in the story. Nice job ma. Jesus is indeed the hope of glory and the savior of mankind. He works in mysterious ways that we cannot comprehend. His grace is sufficient for us and He is the pillar of restoration. Surely, He will deliver us from destruction and will always send help to us just like He did for Razor and Ebony. And may we continue to have an intimate relationship with Him and grow in His love. Thanks so much ma and God bless you for sharing this story. This story shows that God can arrest anybody and make them change from their bad ways. Who would have thought that Razor would change. The power of God is totally capable of doing things we may never expect. I like the fact that Ebony embraced the Lord when he called him. He will definitely last as a believer as long as he is willing and ready to walk in the way of the Lord. The story shows that GOD can change someone from bad to good. I tank God for making Ebong and Razor change. This is a good story to learn from. This story is wonderful and that joy that comes from giving your life to Christ, I was happy at the end of the story when Ebony was saved and Razor's destiny was recovered. Nice write up ma and the story line is superb. Wow! This has been a wonderful thought provoking, and interesting series through out. I couldn't help but wonder when reading this part, how much personal experience or observations you drew from. This particular (part 6) made me suspect, that the enemy finds different tactics convenient or successful, per location or culture.......... I have no doubt that the enemy is busy attacking and prowling, and YET, OUR GOD WINS. Praise His HOLY NAME. So glad you followed the series to the end. Yes, there's some cultural element involved but as you said, no matter what the devil comes up with, God is capable of neutralsing it. Have a lovely afternoon. Such an interesting end. Thank God for the encounter Ebony and his sister got. God truly is merciful and He said He will have mercy on whom He pleases. Dinma is really blessed to have gotten God's mercy, not all get such a second chance. I'm glad you enjoyed the story. You are sooo blessed! I love the way the story ended on a good and positive note. Not the usual way of the guy finally having upper hand and satisfying his selfish interest and lust. we are the straying sheep while God still remains the ever-loving and faithful father who never gives up on us. He uses anyone in bringing us back to Him and the best thing we can ever do, is surrendering to Him and allowing Him to lead us. Ebony has experienced that true and personal encounter with Christ and thus, his life will not remain the same. am so happy this story ended well. it has taught me to never judge people before getting to know them better just like in the case of Mama Chinonso whom most thought had an ulterior motive. you are simply the best, ma. Glory to God! Someone who walks by the Spirit may be hard to pigeonhole and can easily be understood by those to whom everything is black and white. I believe Ebony will actually last long as a Christian, the joy of serving the Lord is already in him. It's a good thing that Razor and Ebony surrendered their lives to Christ. I love the ending to this story, it's a good thing that Ebony was not blinded by lust and the fact that Mama Chinonso was the vessel the Lord used to save them. I honestly love the way this story ended. I am glad Ebony and Razor found Christ and I feel they would continue to follow God's path (if the story continued). Interesting story Ma, God bless you abundantly for your stories are inspiring. Remain blessed! Oh my God... The story took an unexpected turn and I am filled with awe and my body goosebumps. Wow!!. God is really a wonderful God. An awesome Messiah. The lion of Judah. He saved Ebony and His sister from the claws of Satan using his beautiful neighbour whom I had misjudged from the previous episodes... God is the way... The truth and the life... Whomever comes to him is saved for eternity. God is awesome!!. I love the story and the end is fabulous!! I didn't see this coming. thank God for Anastasia. No one ever encountered the light and remained the same. Mama Chinonso is more than just a nice neighbour...she is simply an angel put in place by God to lead Ebony and his sister back to God. Really, when God is interested in your soul, he would stop at nothing to bring you back to him no matter how far away you are from him. A wonderful story this is ma! Tasia is truly an epitome of beauty in an angel form. She is a rare being with whom God recued Razor and her brother Ikem. You know what, God has a divine way of recuing a lost sheep. Statistically man is myopic. And hence the reason for his Jekyll and Hyde personality. Leave God to do the work, just worship him and your life will never remain the same again. I was happy at the end of the story when Ebony was saved and Razor's destiny was recovered, no matter how big we think our sins are God is always ready to forgive us all we need is just surrender ourselves to him sincerely. Ebony and her sister got saved at last! Thank God and i believe their union with Jesus will last forever. God has saved and shown them His love and Ebony will ever be in His presence. The story is interesting and life lesson for all. The story line is something that could not be guessed. Jesus is ever merciful and it does not matter our fault or dark life. He is the light knocking at the door of our hearts to come in and deliver, change us from all darkness to His light. We the children of God should always show His love and be ready to carry out responsibilities that He would help to see the future and help others. It appears that Ebony's conversion to faith had turned out to be his best decision ever made, his joy towards it is very much evident. what a proper way to end such a lovely story. Who would have believed that Tasia has such deep relationship with God? Indeed things are not always the way they seem to be. Razor, finally received Christ and Ebony on his part entered into relationship with the lord. This is absolutely unpredictable. The suspense, the actions, the dramas, etc all contributed in making the story very interesting, and captivating. Thank very much , Ma. I really Enjoyed Myself. Keep doing the good work! God Bless You Exceedingly!! This is amazing. Tasia is a Powerful Woman of God? Razor, a member of devilish society? Ebony now a Born again Christian? Unpredictable! Ebony appreciates Tasia for her true love since he moved in. This story teaches that no matter your condition or how bad you are, God can still redeem you and make you his son or daughter. God proved to Razor that despite his allegiance to the kingdom of Darkness, He still loves and protects her after all, "He Died for Her". Jesus died for Our Sake and to Ebony not even his dirty feelings for Tasia could make God abandon him. God comes to save at his appointed time. The story is too God. God bless the active Hands of our Aunt. God bless you, Ma. You are very Creative! God can use anyone to lead you to Christ, thanks to Anastasia, she's God sent. Wow..that was...intense. I could almost imagine myself there with them, watching the whole thing like it was happening in front of me. And my heart was racing...lol. Thanks be to God. He has finally saved his own. Nice one ma. I think I prefer this series to From Bait to Catch. Wow! This story is filled with morals. if I say I didn't learn I would be lying. God has a way of doing His things, He knew the day would come when Ebony and razor would surrender to Him, that is why he made Ebony pack to the apartment, built such relationship between mama chinonso and him and other subsequent happenings. The ways of men cannot be measured with your way o lord. Ma God bless you so much for this series. With God all things are possible. Ebony will last as a child of God by the grace of God. Doubting that is doubting what God can do in the life of a man. God is faithful. hmmm, am short of words,i never expected such ending. God is too good and gracious,he is a patient God that loves us unconditionally. this story can keep any christian going and give hope to the unbelievers.This is the most wonderful story i have come across in a long time. in you i have seen the full representation of the excellent spirit of Daniel, i tap from that blessing ma. you are are a blessing to us. I almost cried while reading this. God is indeed wonderful and He is always there for us. He speaks to us in diverse ways, we should learn not to block Him or run from Him. Humans, especially the men, need to understand that not every prettty, glowing woman is immoral. There are devoted Christians amongst them and this teaches us that our physical beauty should not be used for the wrong reasons, rather it should be used to serve God wholeheartedly. i really enjoyed this story. Remain Blessed ma. Waoo! Waoo! Waoooo! This is really amazing, from the beginning to the end is just so captivating, a very nice work ma, coming to the answers of the question in the story, God's revelation of himself to Ebony attracted his full repentance.God works in a mysterious way ,he can manifest his glory through people just as the way he uses mama Chinonso to deliver Razor.God's manifestation of his powers on this two siblings will make them steadfast in their faith because they surrendered and accepted Jesus with all their hearts.lessons from this story: 1. We never know what gift God bestowed on us till we give him chance in our lives, this can be in the life of razor whom have a greater power to work for God but his father used it as an advantage to restore his own devilish power before he died. 2 .Never condemn any soul based on their past mistakes. 3. Let our love for people be genuine and not be based on the lustfulness of the flesh. Ebony and Razor's confession regarding to faith is good , there is nothing like believing in God, I mean they are Christians but not church folks but God spoke to ebony and he surrendered to God, that is he is now born again and willingly to change and be a better person, I think ebony can last as a believer, Yes, I have, at first I thought every was just normal that is ordinary but the intervention of God when I seek his help in my life and I started seeing things beyond the ordinary. Yes, ebony faith can last as a believer because he gave his life to Christ and he is willing to be a true servant of God. Yes, but it was not easy and with God all things are possible, Thank you ma, the story was indeed educating to me. I think Ebony can last as a believe, I mean he gave his heart to God, his is willingly to serve and worship God, he is born again .I have encountered a life-threatening situation but it was God the almighty that saw me through and I thank him for everything he is been doing in my life, well, sometimes, it is good to talk to people in a polite manner. God has shown me so much goodness that I even ponder at times whether I deserve it. God has saved my life in countless situations and even given me hope when I lost all hopes. this story is wonderful, it gives people an assurance that no matter what God is always there to support, protect and embrace us no matter what kind of sins we have committed. Am very happy with the turn out of things. God bless u ma for this inspiring piece. Yes I have... I have faced a life threatening situation where I was poisoned. It defaulted medical predictions and medication.. I was left at the mercy of God who failed not to prove himself. He healed me of what could have led to people's death. This story is just another confirmation that God loves us... If we can understand His sacrifice of love for us, we can fulfill His predestined plans for us.. Lovely piece MA, more grace. With all ebony just saw and even experienced first hand,I think he will last and probably spend the rest of his life in a Christ like way. I have never been in any life threatening situation but I have heard of so many and the way the Lord intervened and saved his children,you will know this Lord we are serving is a true and living God. Wow, this series has been a rollercoaster of fun.God is an all knowing and all seeing supreme being and as such he knows our deepest darkest sins and desires. I am happy that Dinma was delivered from the clutches of darkness. Thank you ma for this wonderful story and always remain blessed. the lord is good, he has delivered Razor from the powers withholding her praise be his name. it was a wonderful read from the start, nice work ma. What a victorious ending. True beauty is not on the physical body, but in the soul. This is an eye opener for true Christians to use their beauty given to them by God to serve him. I k new God had a hand in this whole situation from the beginning. I'm happy God use Tasia to save Ebony and his sister, Razor, at last. This is an amazing story, I’m so excited. It is a bit different from the usual romance, although the ride through has been a rollacoaster, I’ve really enjoyed it. This story has a beautiful ending. This story postulated that salvation and transformation can reach anybody at any time, and God has a way to draw his children close to him. This is a mind blowing short story. I think this will serve as a mirror to our women today. So that they will know that beauty is a thing of good virtue and knowing God. This story is really glorious. Wow!!! One doesn't have any security except in Christ Jesus! I just learnt from this post now that we are representatives of God here on earth! I'm a physical Jesus. The believer has so much authority within him but most times we don't even know so we end up falling for the devices of the devil. Secondly, the devil knows someone that will challenge him when he sees one and he'll go to any length to stop one from fulfilling purpose. This was eye opening. I choose to wield my authority!